Sic ’Em Sports brings football to your fingertips! 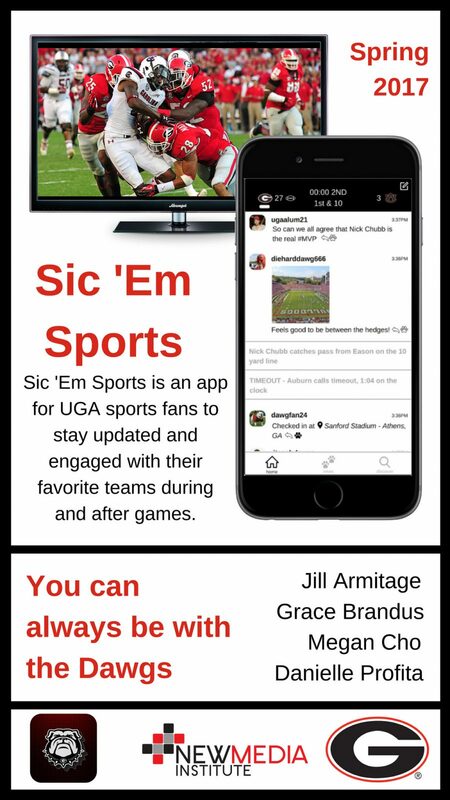 Sic ’Em Sports is currently a fully functional second screen app prototype developed for UGA Athletics and set to kick off for the 2017 Football season. 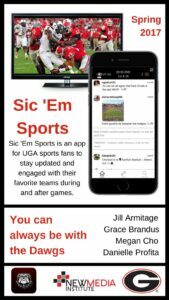 This app is the one stop shop for an all-in-one iOS application that UGA sports fans use to stay updated, connected, and engaged with their favorite Georgia Bulldogs during games, and after games. Through live updates, hot news, social integration, and exclusive content, Dawg fans never have to worry about missing out again! Not only will users be able to stay on top of all that Georgia Football has to offer, but they can also stay in touch with the entire Dawg Nation! Beyond enhancing live game viewing, Sic ’Em Sports will serve as an online community for Dawgs across the country, and a platform for our fans to engage with one another. Though our current and primary focus is on football, It will eventually extend into all facets of UGA sports, from swim meets to basketball season to volleyball games. The primary focus in the app is creating a sense of community for those watching the game at home by displaying posts from Facebook, Twitter, and Instagram on a news feed. Therefore, users can scroll through and pick out conversations they want to engage in. The strategies in Sic ’Em Sports to keep people from switching channels during commercial breaks are engaging games, behind-the-scenes interviews with the coaches, and more. Through use of Sic ’Em Sports, the Bulldawg Nation is connected together, even when we can’t all be in Sanford Stadium. Sic ’Em Sports has the potential to impact not only UGA fans in Athens, GA but, UGA fans around the world! This unique second screen application will provide fans, who are both watching and not watching the game, with an opportunity to keep up with the Dawgs on their journey to victory. In addition to the potential local, regional, national and global impacts, Sic ’Em Sports is also a leading form of social interaction. With the added feature of linking social media accounts, users will post straight to Facebook, Twitter and Instagram without ever having to leave the app. Lastly, a live scoreboard is fixed at the top of the app screen and users will be able to pull down on this scoreboard to reveal a more in-depth scoreboard, including timeouts, downs, possession, and time. We are so thrilled to be working with UGA Athletics on this groundbreaking idea. Our liaison, Jen Galas, is the Associate Director of Digital Services for Social Media for UGA Athletics. She has given us such creative freedom with our ideas for the app and we are looking forward to showing off our ideas off to her department at SLAM. We are designing something so groundbreaking for the user that it compels fans to engage in the app whether there is a timeout, a bad call or just to check when they are missing the game. There is currently no app like this sponsored by UGA Athletics. If our prototype is to the liking of UGA Athletics, they are planning on building out the app for a 2017 football season launch! Go Dawgs!